Meglitinides are commonly used with people who have Type 2 Diabetes. People who have this disease produce less insulin which makes their blood sugar levels hard to control. Meglitinides help the beta cells in the pancreas be stimulated, which results in the body producing more insulin. This helps the person’s body handle sugar glucose better and maintains lower blood glucose levels. Meglitinides first came on the market in 1997 for the treatment of patients with Type 2 Diabetes. Normally they can be taken two to four times a day with meals. It depends on the individuals eating patterns. Meglitinides can be used with other medicines, or taken alone. The most common Meglitinides are Prandin (repaglinide) and Starlix (nateglinide). Prandin is used in addition to diet and exercise and can be taken along with other Diabetes medications. Starlix works well with patients who do exercise and watch their diet, but isn’t enough. The person’s blood sugar is still high. That is when Starlix becomes a great option to choose from. They can also be used with other medications, but the patient will have to plan with their Doctor to make sure it will be safe. Meglitinides are similar to Sulfonylureas. The difference is, is that Meglitinides are impatient. They want insulin right away. Another difference is that in Sulfonylureas, they linger throughout your body’s system throughout the day, while Meglitinides quickly rush in and out. Since these Meglitinides act this way, they handle Type 2 Diabetes very well. Meglitinides are not for everyone, though. 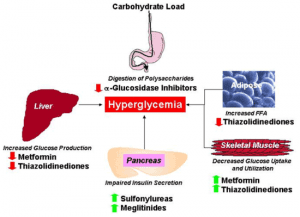 Meglitinides helps people whose pancreas still produces at least a small amount of insulin. It does not particularly lower blood sugar. Therefore, it is not an option for insulin and will not work with people who have Type 1 Diabetes. Meglitinides are also not recommended for people who have physical stress from a surgery, infection, or injury. It is also important to remember that Meglitinides are taken with food. So, if you do not eat regularly, you cannot take the Meglitinides without something to eat. Like with all other medications, Meglitinides have side-effects. The most common effect is low blood sugar, also known as Hypoglycemia. When this happens, the person will feel lightheaded, sweaty, and possibly confused. The best thing to do if this occurs is for the person to eat or drink something with glucose. Juice or milk is two options. If not treated, it could turn into Diabetic coma. If this happens, it is best to get the person emergency help. Some Meglitinides can also cause cardiac problems if used with long-acting insulin. It is also common for there to be a weight gain when using Meglitinides. Other uncommon side-effects that can occur when taking Meglitinides include chest pain, backaches, headaches, vomiting, adnominal issues, joint pains, and tingling skin. It is important to find information about Meglitinides before you decide to take it. Some Meglitinides can interact with other medications. So before taking them you need to talk with your Doctor and review the other medications you are taking to make sure they will be fine together.